London promoters Cosmic Carnage are ecstatic to announce that they will be playing host to Northern Ireland’s heaviest export, SLOMATICS, when they head to the big smoke for their first ever London show. The band are bound to crumble foundations with their prog inspired Doom/Sludge which Pete raved about in his review of their current album Estron “Slomatics have made their departure from being simple volume bruisers by trade to incorporating some very, very dark atmospheres into this true prog-doom gem“. Joining them with be UNDERSMILE, GREY WIDOW, THREE THRONES, SLOW PLAGUE plus DJ’s until 1am to making this a truly heavy night that should not be missed! 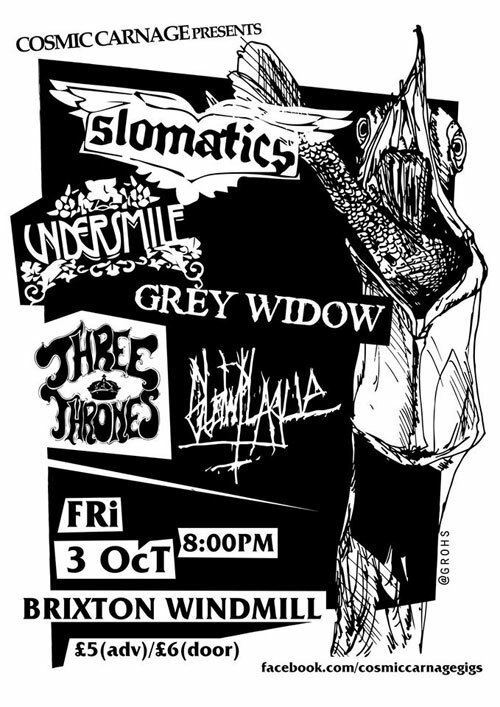 The gig takes place on Friday 3rd October at the Windmill in Brixton, London, tickets are £5, available from WeGotTickets and you can also check out the Facebook Event.